Pope Celestine V(Latin: Coelestinus Quintus; 1215 – 19 May 1296), born Pietro Angelerio di Morrone, was an Italian cleric of the Roman Catholic Church and the 193rd Pope for less than six months in 1294. Celestine V is a saint of the Catholic Church. Pietro Angelerio was born in the Neopolitan province of Moline. In 1232, Angelerio became a Benedictine monk at age 17; and he was later ordained a priest. In July 1294, the monk was elected pope; and in the same year, he abdicated or resigned from his office. Pope Boniface VIII confined the former pope in the castle of Fumone, and he died there. In 1313, Celestine was made a saint by Pope Clement V.
↑ 2.0 2.1 2.2 2.3 "Pope St. Celestine V," Catholic Encyclopedia; retrieved 2011-11-3. ↑ Lizzy Davies. "Pope Benedict XVI resigns," Guardian UK). 11 February 2013; retrieved 2013-2-11. ↑ Society for the Diffusion of Useful Knowledge. (1836). "Celestine V," Penny cyclopaedia, Vol. 6, p. 400. ↑ Beckett, William. (1836). "Celestine V," A Universal Biography, Vol. 1, pp. 720-721. 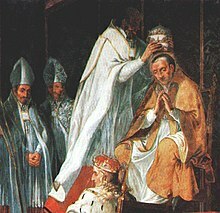 "Pope St. Celestine V". Catholic Encyclopedia. New York: Robert Appleton Company. 1913. This page was last changed on 7 March 2018, at 05:03.